Our EMS Manager performs supervisory and administrative duties necessary to command, direct, and coordinate the operations of the EMS Division within the City of Bullhead City, and performs related duties as required. The EMS Manager oversees all the medical training and certification of our Paramedics and Emergency Medical Technicians, and is responsible for department compliance with all State and Federal regulations regarding medical services. 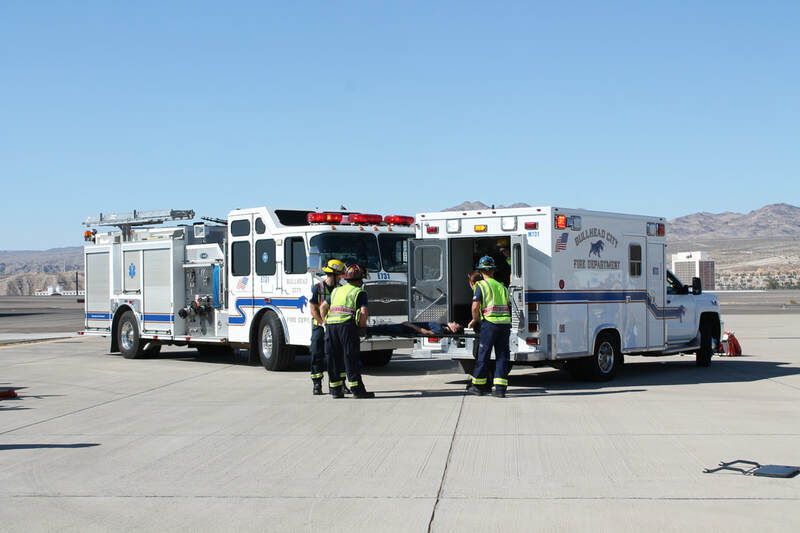 The EMS Division is responsible for the medical services training and logistic needs for the fire department. It supports 47 paramedics and 44 EMTs through in-house training. Other functions of the EMS division include quality assurance, liaison with the base hospital, and management of a community CPR program. The EMS division is also responsible for strategic growth to help keep the department at the forefront of emergency medical care. Bullhead City Firefighters, shown to the left, are participating in a training drill for mass casualty incidents. . This training includes reinforcing the new mass casualty identification cards and having the firefighters walk through the mass casualty trailer. The trailer is equipped with backboards, an oxygen tree system for ten patients, bandages of all sizes, blankets, cervical collars, and head beds. The trailer ​also contains logistical supplies such as cones,tarps, flashlights, and lifters for moving patients on a large scale emergency.